A concept for space debris removal by bi-directional momentum ejection from a satellite. Credit: Kazunori Takahashi. The Earth is currently surrounded by debris launched into space over several decades. This space junk can collide with satellites, causing damage and creating more debris. To preserve a secure space environment, the active removal or de-orbiting of space debris is an emergent technological challenge. If remedial action is not taken in the near future, it will be difficult to sustain human space activities. To overcome this issue, several methods for the removal and de-orbiting of debris have been proposed so far. These are classified as either contact methods (e.g., robotic arm, tether net, electrodynamic tether) or contactless methods (e.g., laser, ion beam shepherd), with the contactless methods proving to be more secure. 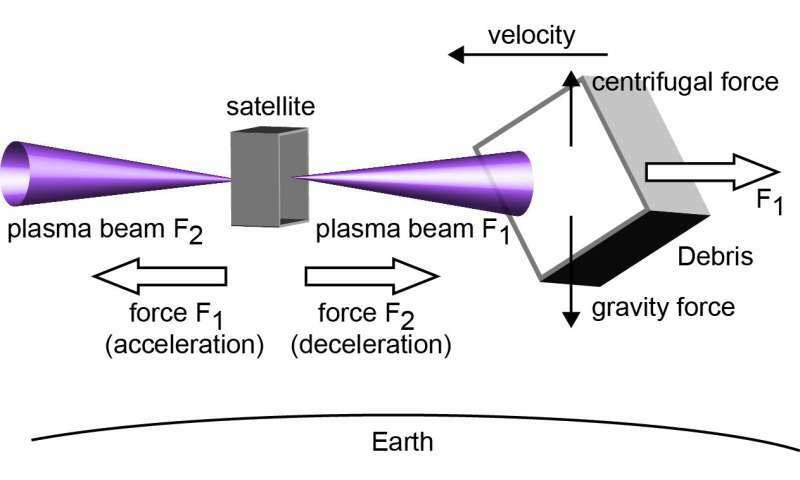 The ion beam shepherd contactless method uses a plasma beam ejected from the satellite to impart a force to the debris, thereby decelerating it so that it falls to a lower altitude, re-entering the Earth's atmosphere and burning up naturally. However, ejecting the plasma beam toward the debris accelerates the satellite in the opposite direction, which makes it difficult to maintain a consistent distance between debris and the satellite. 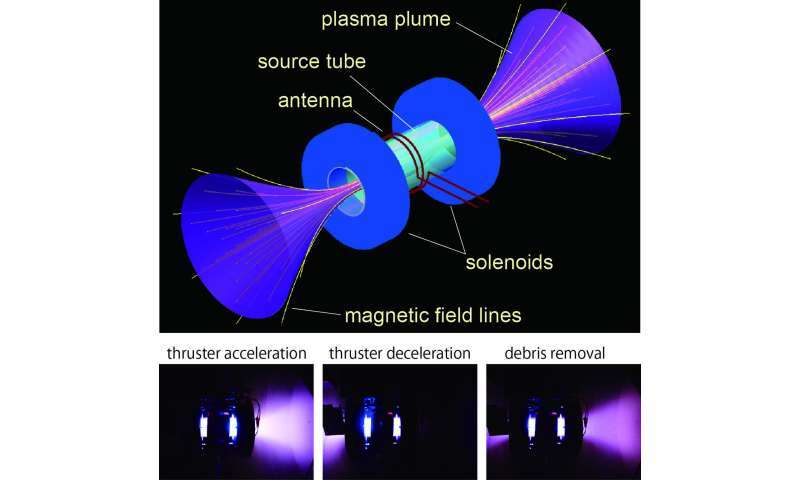 Schematic of a magnetic nozzle rf plasma thruster (helicon plasma thruster) having two open source exits and photographs of the three operation modes in the laboratory test. Credit: Kazunori Takahashi. I would think that if this thruster were to be a practical solution, the beam must remain tightly focused for perhaps hundreds of miles in space, i.e., space at between 100 and 300 miles altitude. An issue that everyone avoids confronting is: When you have hundreds, maybe thousands of plasma jets or other reactive methods propelling spacecraft on LEO? Where goes the plumes, the reaction materials? Who controls traffic patterns that the jets from a passing craft does not accidentally damage a cross-passing satellite? Especially if the owner of the satellite fails to appreciate your claiming priority to cut in line? What if your plume hits a hunter-killer satellite programed to react violently, in micro-seconds, to an apparent attack? In addition to the polluting haze that will accumulate within the gravitational pull and magnetic fields of LEO? Addressing these issues before problems creep up on us? Might be a good opportunity for encouraging potentially profitable innovation with thoughtful cooperation. Oh go ahead, laugh at me. You know you want to! I don't believe we will overcome our vicious monkey instincts anymore than you do. How big do you think this plume is? This isn't a problem unless it is close to the spacecraft in question. Same think with the reaction materials. How on Earth do you think we safely use things like Hydrazine in space? How about any booster for that matter? This is a non-issue. This "plume" isn't a comet tail, no debris is going to hit satellite from the craft (unlike all of the flying junk in space which IS the very problem we are trying to deal with). What if your plume hits a hunter-killer satellite programmed to react violently, in micro-seconds, to an apparent attack? I'm actually concerned with why you think your opinion matters on subjects that you clearly do not understand. Why? chem. Why cause you pessimists are being way too optimistic about your self-delusion that you can dictate reality based on your wishful daydreams. This is a possibly robot guided with little ground direct supervision semi-autonomous machine, like a procostumus in a fish tank that constantly cleans it. Love it.